Remember what it felt like as a kid trying to fall to sleep on Christmas Eve? For riders, that same feeling starts right about now as planning begins for the annual trek to the 77th Annual Sturgis Motorcycle Rally held August 4-13 in Sturgis, South Dakota. In addition to the seasoned regulars attending the Sturgis Rally each year, there are thousands of riders who continue to dream about going to this sacred rally for the first time. It’s going to be super easy for one lucky rider to go this year! 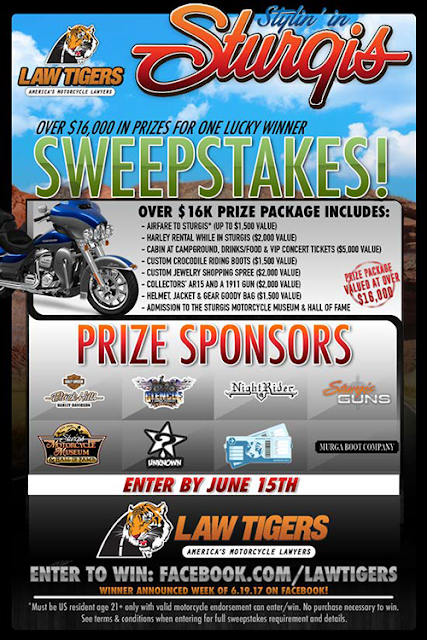 Law Tigers Motorcycle Lawyers and seven fine Sturgis retail businesses are giving away a $16,000 prize package to one lucky rider in the Stylin’ in Sturgis Sweepstakes. For all the riders reading this, grab a napkin because there might be some drooling in the very near future. What does one lucky winner actually win? A round-trip air fare courtesy of Law Tigers Motorcycle Lawyers. But what about a bike? No worries, Black Hills Harley Davidson has it covered with a week-long, brand new Harley rental, valued at $2,000. To dress up the look on that sweet Harley, how about a new helmet, jacket and other accessories valued at $1,500 from Unknown Industries sound? Picture yourself in a cozy cabin at Glencoe Camp Resort for the week, plus drinks, food and VIP concert tickets valued at $5,000. Murga Boot Company will make a custom pair of crocodile riding boots for the winner. With boots like these, shiny new hardware from a $2,000 shopping spree at Night Rider Jewelry is in order. Sturgis Guns wants to ice the prize cake with two guns, an AR15 and a 1911 collector’s gun, valued at $2,000. And whenever a break from being the most stylin’ rider in all of Sturgis is needed, visit Sturgis Motorcycle Museum and Hall of Fame as much as you like. Nice package, right? 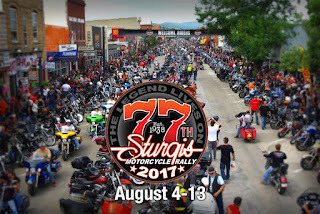 How to enter the Stylin’ in Sturgis Sweepstakes? It’s simple—takes about 30 seconds to win the trip of a lifetime. Click to enter or visit Facebook.com/Law Tigers. And hurry. Deadline is June 15. Good luck! 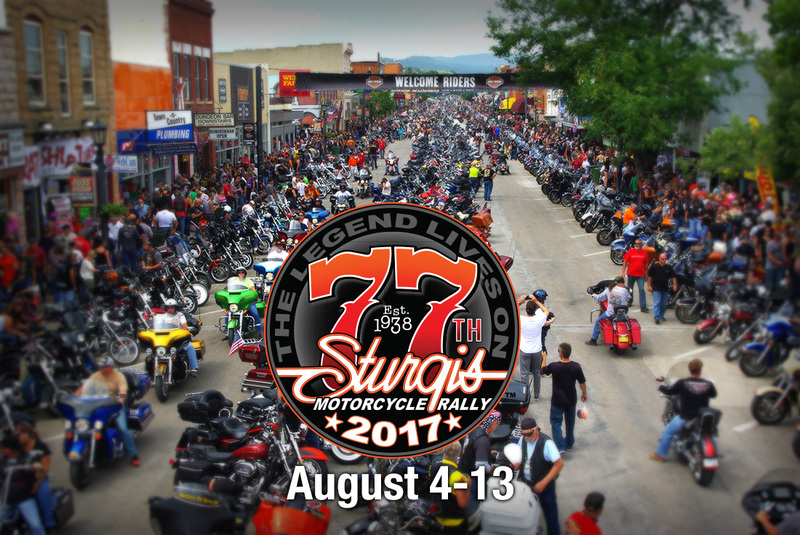 Win a $16,000 Dream Trip to the Sturgis Motorcycle Rally in August!